Gosh, does it ever feel great to be back in the Midwest. Fall is in the air, and Chicago is flat as a pancake! There is a reason why people like to run the Chicago Marathon. Sure the people and the sights are great, but Chicago is one flat land and that makes for easy, speedy running. 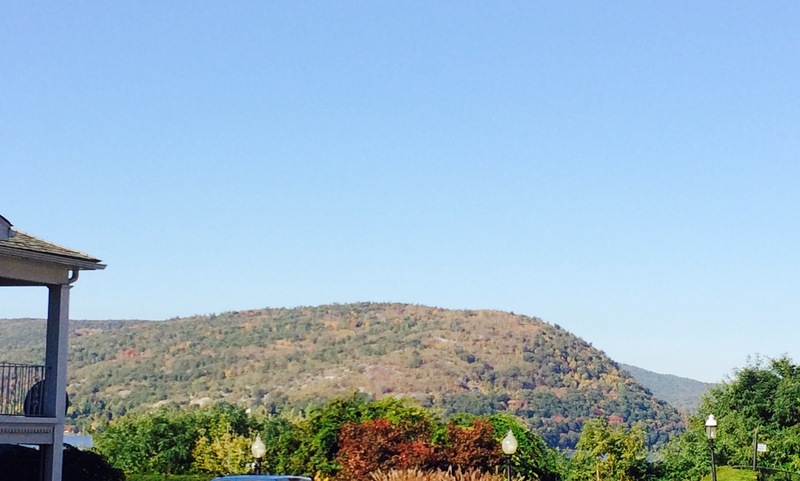 When Rock and I arrived in upstate New York a few weeks ago we were met with the most beautiful sights. 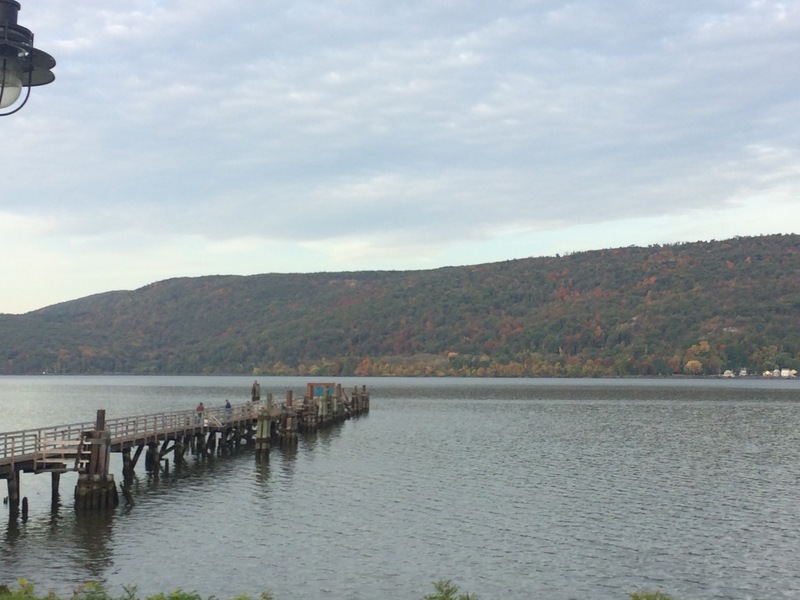 The trees were changing and we were staying in a cute little motel right on the Hudson River. Check out the view from our room. Not shabby. That was until I went for a run. The first time I took a route that had me running over a rolling terrain. But it went through town and stopping and starting with the traffic was not what I was looking for. One of my favorite things about being in a new spot is getting out for a run and exploring. I soon found a route that followed the river for awhile and headed out to an old pier. From there I wound around residential streets and saw the cutest houses. I loved this route, except for one big problem…..hills! The entire route was uphill until I decided it was time to turn back home. And we weren’t talking rolling hills. These are foothills of the mountains. One day as we were driving to get something I remarked to Rock that we were in the area where I was doing my runs. He kind of laughed and mentioned something about mountain running. So yes, that first half of the run sucked. And my paces blew! I would look at my watch and feel pretty awful about my paces. I felt like I was out of shape or losing my endurance. However, over the next few days I noticed that my legs were starting to feel achy and also stronger in different places. And then something awesome happened. I went for a run in Central Park. If you have ever done the loop of Central Park, you know that it is rather challenging six mile loop of rolling hills. It is a great place to go for a workout. As I started running the park, I had very little expectation. My pacing had been slow ever since we arrived after the marathon and my schedule had only been allowing for sporadic runs. But when my Garmin beeped after the first mile and I looked at my watch, I was running 30 seconds faster than my typical pace. I was running what I would consider a speed workout pace. The next mile beeped and I was running even faster! Remarkably, I wasn’t trying to push the pace and I didn’t feel winded either. And my legs felt incredibly strong. This was a true testament to the benefits of training on different terrain, notably hills. While I definitely recommend that anyone who is going to a hilly race make sure they include hills in their training, everyone can benefit from some uphill running. Changes in elevation, even minor, engage different muscles. It makes them stronger and uses different muscles that we don’t always call upon during our daily runs. It will not only make you faster but a stronger and healthier runner. Hills provide a challenge that can also work as excellent mental training. Working to push past new barriers will strengthen your mind come race day. And if anything, you will appreciate your flat runs even more. 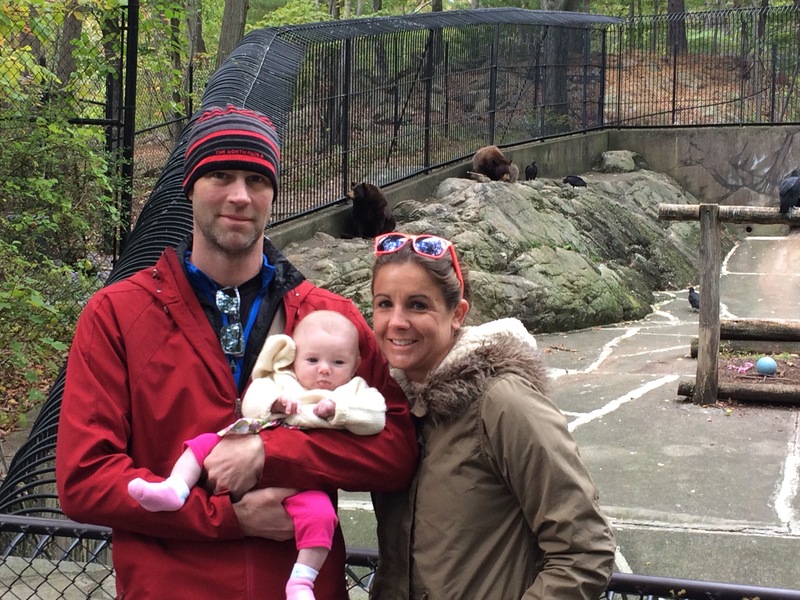 We stopped at Bear Mountain and went to the zoo. Rock and I did a trail race here once that was all uphill. It was brutal! Don’t have hills near you? Go ahead and take it to the treadmill. Research has proved that we no longer need to run on any incline to mimic our typical running. So use the occasional run as a chance to bump up the incline for a bit or create a hilly fartlek workout on the mill to mix it up a little. Do you love or hate hill running? Great post! I don’t love hill running but can truly feel it during a race if I hadn’t included hills in my training! It’s tough to find hills where I live, but I have also found that increasing the incline on the treadmill helps. Thanks for this post, and happy running! I LOVE hills, and living and running in Vermont, I can’t really escape them anyway. How awesome is that. I bet you run incredibly well when you end up on flat terrain! I love hill running, it is amazing for strength and speed and once you hit flat running you feel like you are flying. Exactly. I think it is also great to come to terms with hills and learn to love them. It makes it much easier when you do a hilly race, to not feel so defeated. I hate hill training, though we have no shortage of them up here! I’ve injured my calf twice during hill workouts but I will concede they really help build strength and make the flat sections during a race seem a bit easier. My long run course typically has 5-6 miles of rolling hills before evening out, though I haven’t run specific hill repeats for a while…I prefer speed intervals. I like speed work too. Both are a love hate for me. It’s crazy that you saw the effects of hill running that quickly!! If only it were that effective for me. 🙂 We really want to do the North Face Endurance Challenge located at Bear Mountain. That Bear Mountain North Face race is really awesome. Let me know if you ever do it and we will come cheer you on! I live in Wellington New Zealand and we all have to run hills here 😊 you can’t avoid them. That is awesome! I bet it is beautiful. I hilly trail running. My paces are terrible when Ido it, but when I am consistent with it and then switch over to a flat course I find that I’m ready for ANYTHING, especially those pesky hills that race directors love to put at end of races! Haha, they do like that don’t they?! But I completely agree! They really stink sometimes when you are doing. But come race day you are capable of anything! Yup, definitely agree! 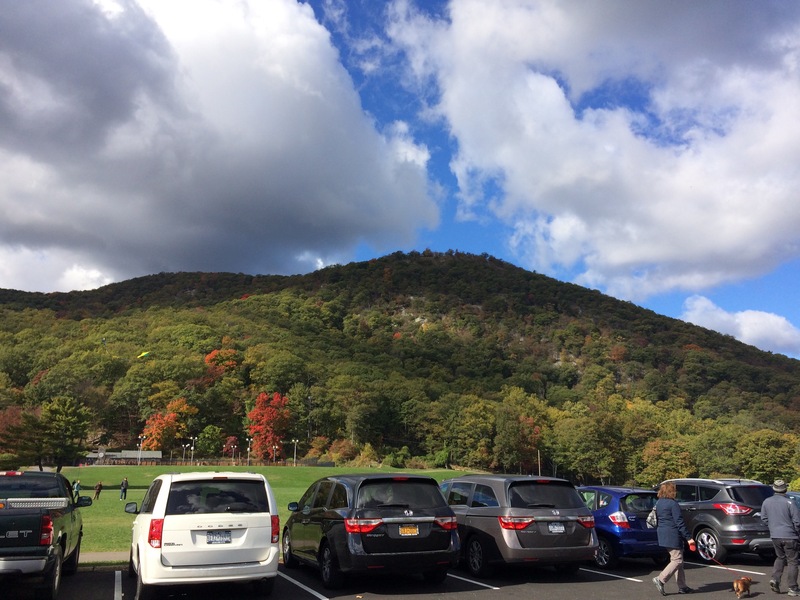 I did lots of hill training because of the the long runs in Central Park and Prospect Park. It definitely helped when I had to deal with rolling hills for Wineglass. Oh I bet! Central Park is a great place to get those hills in. I have seen posted in a few blogs about hills and it’s inspiring. You never know when you may be running on a hill in a race or otherwise. It works the muscles in a different way for sure! Yes, hill training really is an important component of becoming a better overall running. And as someone else pointed out, race directors love to throw a hill in at the end! I always prefer running trails to flat concrete. Unfortunately I can’t access trails as much as I used to. Instead I run on the beaches which is just as challenging as hills. Somedays I want to scream at the lady telling my pace, I’m running on sand, give me a break! Of course I’m gonna be slower! Beach running gains are gradually making changes to flat! Oh yes, beach running can be brutal. Sometimes it really messes with my calves. I had to laugh at idea of being pissed with the lady telling you the pace. She just doesn’t get it, does she?! I felt like screaming at my Garmin too. “It’s not me, it’s the hills!” I too love trail running. I wish I could do it more. I love hill training! Sadly, I didn’t do a lot of it this summer because I knew I was training for flat races. While I think I should have still incorporated it, it was the first thing I would slack on when my legs felt overly fatigued. I am hoping to really get out on the hills this winter to prepare for Boston and Kentucky. I have lots of hills to train on in most of my routes but also some huge monsters very close by that I can use for repeats! Central Park running is BRUTAL – nice job taking advantage if that when you were in town! I hear you. Plus running either river is just so much prettier. CP gets jam packed with tourists and I feel it gets rather dangerous between reckless cars and cyclists. I love hills and it is excellent for training. I loved reading your post and feeling the same way as you did on your run. When you can just go and everything feels right and good. I love those runs! Aren’t they the best? I’m dealing with a doozy of a cold right now, so I feel like I will never feel that way again. But I know that once this passes, it is going to feel so good! Oh the dreaded winter cold that lasts twice as long! Hope you get feeling better!